I purchased a nice shiny new Samsung 4K TV (KS8000 series) earlier this year and within a couple of months, I noticed a screen juddering effect. I’ve been through every setting and tried every suggestion I could find online. I did resolve the issue and decided to write this blog post, hopefully, the checklist below can save you some time and get your Samsung TV judder/flicker issue resolved. A judder is best described as a vertical or horizontal movement of a single frame or an object in the frame. The judder on my TV usually happened as the camera angle changed within a scene, the entire screen juddered, not just an object in the screen, but the entire screen. A flicker is when the TV screen inserts an extra frame between existing frames, to the viewer this may look like a very fast flickering of the screen. A stutter is a momentary pause of the picture and if often caused by lag. Whether you’re experiencing a flicker or judder/stutter, try the suggestions below, you can also undo each suggestion or reset your TV back to its factory settings if none of them works for you. 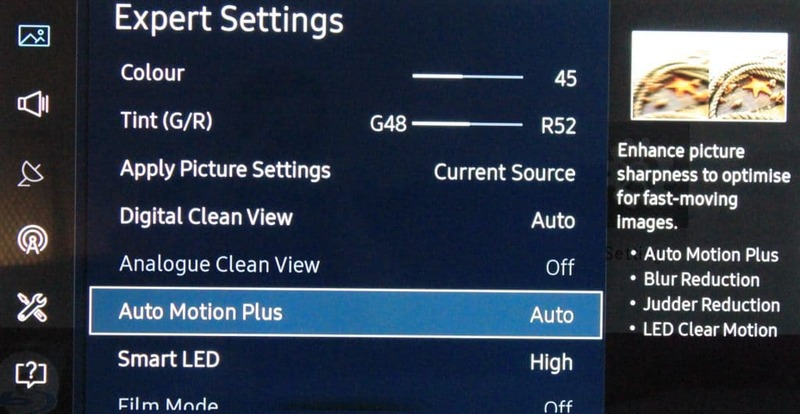 The settings and options on Samsung TVs are all slightly different and depend on the model. You might not see the same options as the ones described below, just go through each option you recognise one by one. The first step in our checklist is to move the wifi router away from the TV. Mine was located directly behind it, so I moved it about a metre and a half away. Interference isn’t a myth, it happens all the time and high powered devices such as wifi routers are often the culprit. The next step is to try and isolate each channel and check for judder/flickering. Are you experiencing the issue with streaming (i.e Netflix), cable, gaming consoles and DVD inputs or is it only one of them? Try swapping the HDMI cable into a different port, it could be an issue with a single port, the cable or a specific device. My issue occurred with all inputs so I didn’t explore this further, but you may need to. Samsung TVs should receive software updates automatically but double check you have the latest version installed. From experience, I know that many software updates don’t always fully install until the device is switched off and on again. If you only ever put your TV on standby, you should completely switch the TV off then on again. 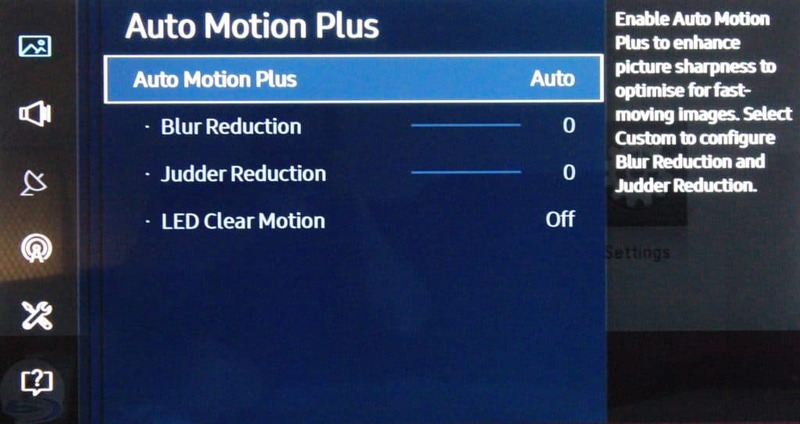 On my TV these options are found under >>>Picture >>>Expert Settings >>>Auto Motion Plus Settings. This option adds extra frames in an attempt to create a smooth picture during fast-moving scenes. The software in the TV analyzes the next frame and in a split second adds an extra frame. As you may know, the more frames per second the smoother the viewing experience. Unfortunately, this prediction doesn’t always work so great. Panning shots work well, as do objects moving in a predictable direction. It works less well on camera angle changes and unpredictable events, such as explosions where artefacts (objects) may appear randomly or move in an odd manner, this may appear as a judder on the screen. With this setting on too high, you may experience a smoothing effect know as the Soap Opera Effect (Google it if you’re unsure). I suggest you start by switching this feature off. Samsung TVs have several energy saving options, when I was exploring help forums and guides, there were many people who suggested deactivating or altering these settings, several reported that their juddering issues were then resolved. This option is a noise filter and works best with older film. It enhances the picture quality by filtering the incoming signal. This adds an extra layer of processing that isn’t always necessary, try changing the setting to see if on/off helps with your flicker/judder problem. If you’re only experiencing the flickering or juddering whilst watching content streamed online, check your connection is consistently fast enough. If the juddering/flickering wasn’t there when you first purchased the TV, cast your mind back to any devices that you’ve since connected, especially around the time you first noticed the flicker/juddering. Remove each device one-by-one to see if your set was experiencing interference. 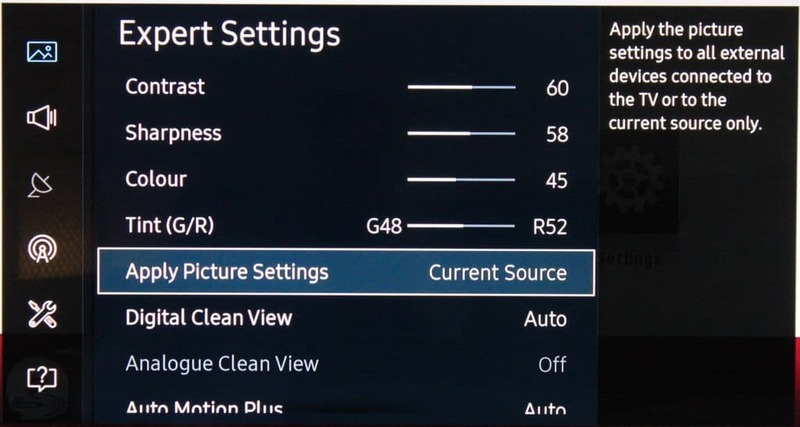 The picture setting suggestions on this page can be saved so they affect all sources (games, DVD, cable etc) or you can create separate settings for each source individually. I’ve found that a Motion Plus setting of “juddering” to 7 or above can create a slight blur on some fast moving objects. 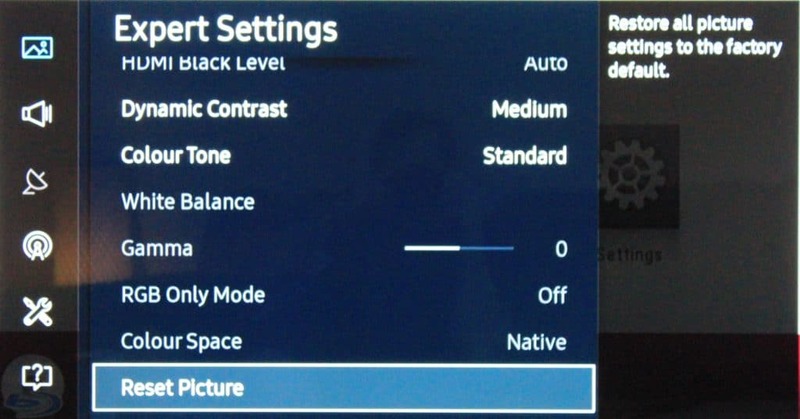 By selecting >>>Picture>>>Expert Settings>>>Apply Picture Settings you can choose to either set globally or individually. This is a great option if you only have an issue with one source such as a cable service. 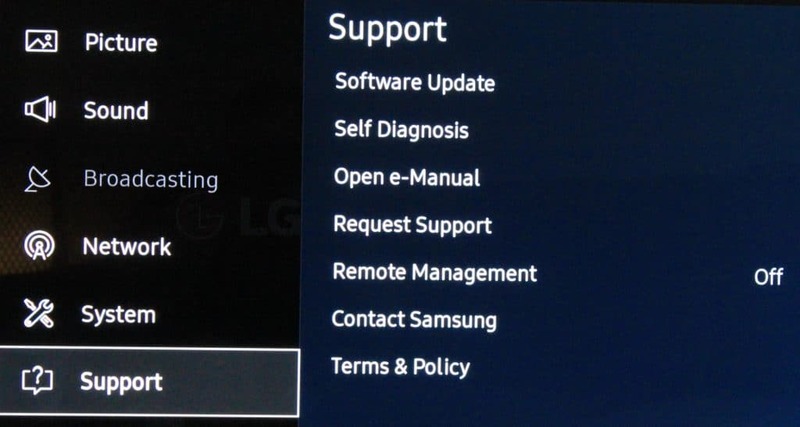 If you suspect the juddering/flickering on the Samsung TV is worse after making some changes to the settings, you can perform a factory reset easily.